Now that the regular season is over and my Browns are set to get a Top-5 pick that they will use on Tim Couch, Courtney Brown or William Green it is time to focus on fake, digital, monopolized football gaming from EA Sports. The issue of trade logic has been a contentious one to say the least. While we will be covering more Madden issues in the coming weeks we will start with what kicks off the football season for most NFL fanatics – the NFL Draft. The Draft is one of the most popular parts of the NFL (minus the Super Bowl). Draft picks are often held at a premium, even more than superstar players… okay, maybe not all teams feel that way (The Oakland Raiders). The issue with Madden’s trade logic is on-going and has been since the game came to PS3/360. One issue that has been in Madden’s trade system since Madden 2002 is the ability to milk teams for draft picks or players based on faulty logic and a broken system. This is covered in the video below. There are many issues with this game that seem cosmetic to most people. However, if you pay attention to sports gaming like some of the people of that niche community do (myself included) you will see that EA has put out an inferior product ever since they got the sole license to create NFL videogames. Back in 2004 they had to compete with 2KSports and NFL2K. While I was never a big fan of 2K’s games, they noticeably pushed EA to put out a quality product every year. Now that that time has passed, we are stuck with Madden and the only growth that comes year after year is cosmetic. While this may seem like is a rant, there is a sincere hope that EA Tiburon makes the needed improvements we will cover in the coming weeks. While the busiest time of year in new games has come and gone there is a lot of work to do in covering some of the biggest releases from late 2011. Battlefield 3, Modern Warfare 3, Skyrim, Metal Gear Solid HD Collection and even a little bit of sports games for those that hold some interest in Madden and NCAA Football. We have a lot of work to do as the new year promises to be one of intrigue. Will Treyarch and EA Sports continue to release sub-par annual titles? Will Mass Effect 3 give it’s devoted fans a good finish to an epic journey? Welcome to 2012! Happy New Year and happy hunting! While we have been primarily devoted to the First Person Shooter (FPS) genre over the first few months of this site, there is some good news on the horizon for people that prefer something more personal to their gaming. Skyrim and Metal Gear Solid HD Collection have been out for just over a month and they are becoming very popular. While Skyrim isn’t much of a surprise on the front of ‘popularity’ there is a new face joining the XBox 360 landscape – Metal Gear Solid HD Collection. 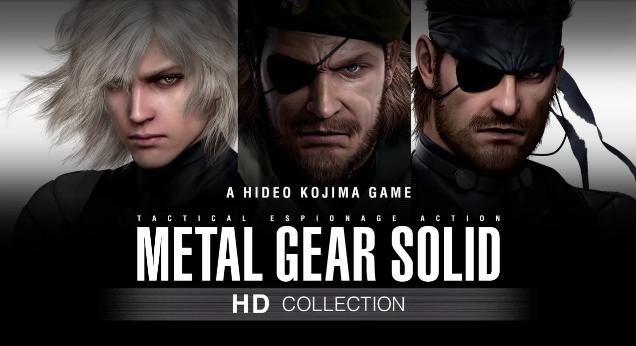 The Metal Gear Series has been primarily on the Sony PlayStation over the past 15 years. While the XBox had MGS2: Substance there really hasn’t been much love given to those of us that were early adopters of the XBox 360. While it is obviously cool that MGS has finally graced us with it’s beautiful High Definition face you should probably make haste (hurry up) and buy it if you see it. It has a retail price of $50 and is currently on sale at Best Buy and Target for $35-40. I believe these sales will end by December 30, 2011 – so get to it if you want/need this. It has been put on back-order for Best Buy Online and you may have to ask someone at Target where they are hiding it (much like I had to). In the coming days we will be churning out a lot more videos for MW3, Battlefield 3 as well as the games featured in today’s entry and blog updates too. If you have any driving questions, shoot us a comment or message on here, facebook, twitter or via smoke signals from your over-heating holiday gaming console.